As Tony Stewart enters the homestretch of his final season, take a look back at his NASCAR career. Corrections and clarifications: An earlier version of this story listed the incorrect winner of the 1996 Indianapolis 500 pole. Scott Brayton won the pole position. 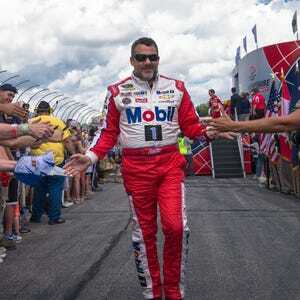 Tony Stewart, 45, is considered one of the most versatile drivers of his era, registering success in every series he enters and every type of car he drives. The Columbus, Ind., native has said this will be his final season racing in NASCAR's Sprint Cup Series, in which he has won three championships. In winning at Sonoma Raceway in June, Stewart earned a spot in the 16-driver Chase for the Sprint Cup and a chance for a fourth title before he retires in November. Stewart began his career racing go-karts, winning the World Karting Association championship as a 16-year-old. From there, Stewart moved up to the United Midget Racing Association and then to the United States Auto Club, where he was named the USAC Rookie of the Year in 1991 and won USAC National Midget Series titles in 1994 and 1995, before winning the USAC Silver Crown Series championship in 1995. Stewart then switched to IndyCar in 1996. He won three times in 24 races between 1996 and 1998 and captured the 1997 IndyCar championship. He started from the pole in his first Indianapolis 500 in 1996 after pole-winner Scott Brayton was killed while testing a backup car. 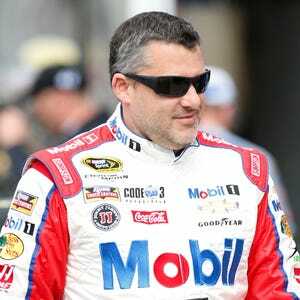 Stewart set a rookie record by leading the first 31 laps and was awarded rookie of the race after finishing 24th. Stewart won three races overall to go along with seven podium finishes. Yearning for new challenges, Stewart moved to NASCAR and joined the Sprint Cup Series as a full-time driver for the 1999 season. 1999 — An immediate success, Stewart ran away with NASCAR’s rookie of the year award, after scoring three wins and 21 top-10 finishes to finish fourth in the standings — setting a record (since broken by Denny Hamlin in 2006) for the highest points finish by a rookie in the modern era (since 1972). Stewart also became just the second driver to attempt the Indianapolis 500-Coca Cola 600 double, finishing in the top 10 in both Memorial Day weekend races and completing 1,090 of a combined 1,100 miles in both races in the same day. 2000 — In his second year at Joe Gibbs Racing, Stewart won a series-high six races and recorded 23 top 10s and 12 top-five finishes to rank sixth in the season-ending standings. 2001 — He won three times, earned 15 top fives and 22 top 10s to finish second to Jeff Gordon for the championship. Stewart once again attempted the Indianapolis-Charlotte double, this time becoming the first and only driver to complete all 1,100 miles. He finished sixth in the Indy 500 and third in the Coca-Cola 600. 2002 — Claimed his first Sprint Cup Series championship, despite being hit with a 25-point penalty following an altercation with a photographer at the Brickyard 400 in Indianapolis. But with three wins, 15 top fives and 21 top 10s, Stewart had enough points to hold off Mark Martin for his first NASCAR title. 2003 — His final rank of seventh in the Sprint Cup standings was his worst so far in the series, but Stewart still recorded two wins, 12 top fives and 18 top 10s. 2004 — He began the season with a second-place finish in the Daytona 500 — his best result in NASCAR’s premier race — but for the second time in three years was assessed a 25-point penalty, this time for throwing a punch at driver Brian Vickers at Sonoma Raceway. Stewart collected two wins, 10 top fives and 19 top 10s en route to a sixth-place finish in the final standings after qualifying fourth for the series’ first Chase for the Nextel Cup playoff. 2005 — At 34, Stewart won his second Cup championship, compiling five wins, 17 top fives and 25 top 10s to hold off Greg Biffle and Carl Edwards. Two of those five wins were monumental as Stewart finally reached victory lane at Daytona International Speedway (Pepsi 400) and Indianapolis Motor Speedway (Brickyard 400). 2006 — Stewart became the first defending champion to miss the Chase the following year, by 16 points. He would claim five victories, but three of those came after the regular season ended. In total, his season included 15 top-fives, 19 top-10s and a rank of 11th in the final standings — his lowest since moving to NASCAR. His season also included two run-ins with Matt Kenseth, first in February’s Bud Shootout and then at the NASCAR All-Star Race in May. 2007 — He finished sixth thanks in part to 23 top-10 finishes. He collected three wins, including his second Brickyard 400, and posted 11 top-five finishes. 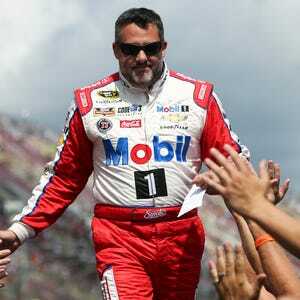 After his Brickyard victory, Stewart was fined $25,000 and 25 points for using profanity during interviews. 2008 — He managed just one victory in 2008, a low to that point in his career. In his final season with Joe Gibbs Racing, he posted 10 top-five and 16 top-10 finishes en route to a ninth-place finish in the final standings. His lone victory of the campaign came at Talladega Superspeedway in October’s AMP Energy 500. Earlier in the season, Stewart announced that he would drive for a new team in 2009 — one that he would co-own with Gene Haas. 2009 — In his first year as a driver and co-owner of Stewart-Haas Racing, Stewart bounced back with four wins and a sixth-place finish in the final standings. He posted 15 top fives, had 23 top-10s and entered the Chase as the points leader. He won the NASCAR All-Star Race for the first time in 10 attempts and scored his first points victory for SHR at Pocono Raceway in June. 2010 — He regressed slightly from his 2009 campaign, finishing in seventh place while winning two races and posting nine top-five and 17 top-10 finishes. Both of his victories came late in the season: In September at Atlanta Motor Speedway and at Fontana, Calif., in October. Stewart won his first pole position since October 2005, when he qualified first at the Texas Motor Speedway race in April. 2011 — Stewart captured his third career title in thrilling fashion, winning the final race of the year at Homestead-Miami Speedway to edge Carl Edwards in a tiebreaker for the championship. All five of Stewart’s wins came during the 10-race Chase, which he kicked off by winning consecutive races at Chicagoland Speedway and New Hampshire Motor Speedway. He finished his season with nine top fives and 19 top 10s. 2012 — He followed his title season with a ninth-place finish in the final standings. He has not finished in the top 10 since. When the season concluded, Stewart had three wins, 12 top-fives and 16 top-10s. Despite a win at Daytona in the Coke Zero 400, the most memorable part of his season may have been when he threw his helmet at Matt Kenseth’s car following a wreck between the two at Bristol Motor Speedway. 2013 — Stewart’s season featured a number of controversies and setbacks. He was involved in post-race run-ins with Joey Logano, in March at the Auto Club 400 at Fontana, Calif., and Kurt Busch, at the Toyota Owners 400 at Richmond International Raceway in April. Stewart would win at Dover International Speedway in June, but his season came to an end in August after he broke two bones in his right leg while participating in a sprint car race in Iowa. He missed the final 15 races of the season, ending his streak of 521 consecutive starts. His final stats: One win, five top-five and eight top-10 finishes. 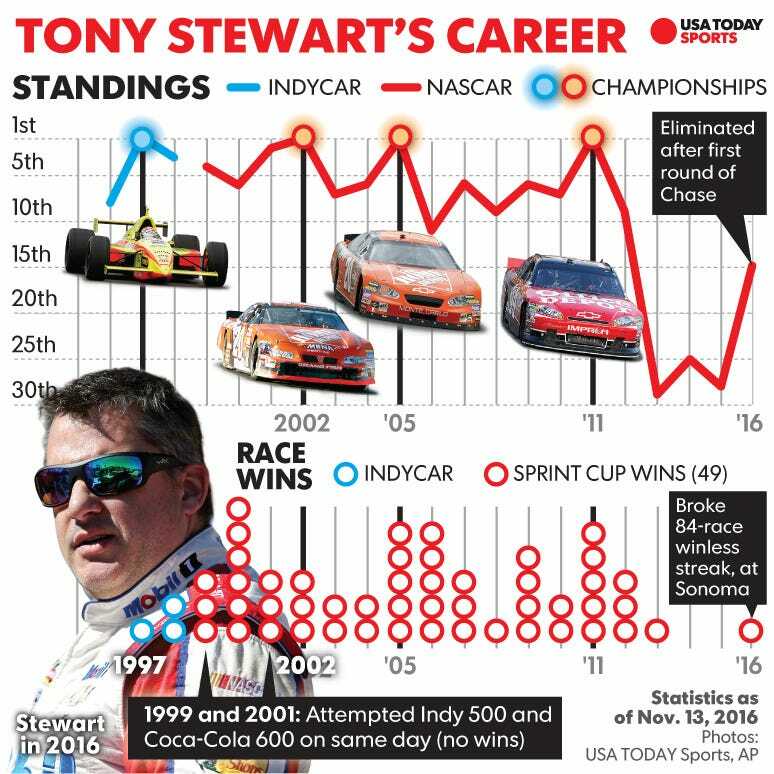 2014 — This season was perhaps the worst in Stewart’s career. A difficult year on the Sprint Cup circuit took a sad turn in August, when Stewart was involved in an accident that killed sprint car driver Kevin Ward Jr. After Ward exited his car following a crash during a sprint car event in upstate New York, Ward was struck and killed when he was clipped by Stewart’s back-right tire. Stewart missed three races after the incident. No criminal charges were filed but the Ward family filed a civil suit against Stewart which still is pending. Stewart finished winless for the first time in his career. He missed the Chase for the third time. He was fined $25,000 and put on probation for a retaliatory bump into Brad Keselowski's car on pit road after an October race at Charlotte Motor Speedway. He finished with three top-five and seven top-10 finishes. 2015 — Stewart raced all 36 points races for the first time since 2012, but did not have any wins or even a top-five finish (a first in his career). He finished in the top 10 three times. In September, he announced that 2016 would be his final season. 2016 — He was sidelined before the season began after breaking his back while riding in the sand dunes of Southern California. He missed the first eight races of the season before returning for the April race at Richmond. Before the race, NASCAR granted Stewart a medical waiver that would allow him to participate in the Chase should he qualify. At the end of June, Stewart earned his first victory since 2013 when he won the road-course race at Sonoma. 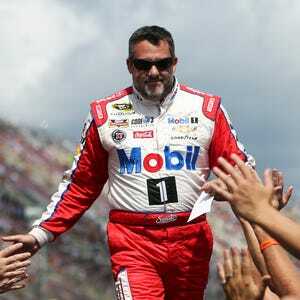 The win propelled Stewart into a provisional Chase berth. Stewart, who entered the playoffs as the No. 11 seed, was eliminated from the Chase after a 13th-place finish at Dover International Speedway on Oct. 2. His final Cup race is this weekend at Homestead-Miami Speedway, where he has won three times, most recently in 2011 when he clinched his final championship on a tiebreaker with Carl Edwards.